Before I started tying my own flies I would often go to different websites to find cheap flies that I could fish with. I just wanted to pick up as may flies as I could so I could get out on the water and catch some fish. There were endless amounts of websites online that sold flies for very cheap but how quality was their product? Was the pattern the in the right proportion? Was the pattern tied with the right materials? What was the quality of the hook? How durable was the fly? These were some of the dilemmas that I faced when buying flies online for less than a dollar a fly versus buying them at the local fly shop for two dollars a fly. 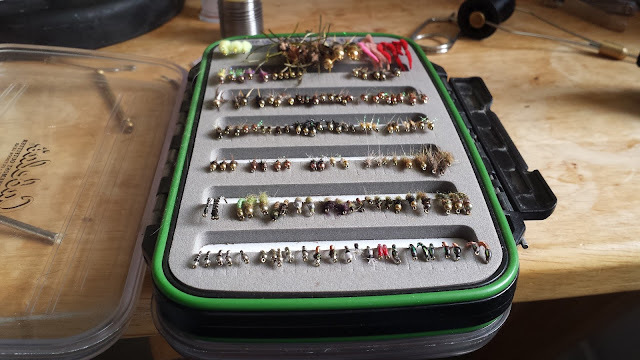 Fly shops have invaluable information about flies that will work for the particular water you will be fishing. Have them show you a few patterns and purchase a couple to thank them for giving you some good information. These will also be a good reference for later. Once you have the flies that work for you, you can try and look for cheaper alternatives locally or online as you now have an idea of what you will need. 2. Avoid paying full price for common patterns. These are some of the most well-known patterns that will catch you more fish than any other fly in your box. However, they are so common that paying over a few cents for them may hurt your budget in the long run. 3. Professional vs. not so professional website design. It can be hard to find an online dealer that is reliable in shipping, product quality, and customer service. The factor in which I choose to buy or say good-bye is professional website development: how easy is it to navigate their site, spelling and wording accuracy, picture quality, website reviews, etc. The more time they put into their website will hopefully mean the more time they spend with their customers. Fish will often be selective on the color, size, and look of your fly. With that being said, its always good to get the same fly pattern in different colors, sizes, and styles. Try not to buy duplicates as it can be hilariously frustrating when you have five of the exact same pattern in your box that don't work. The only way to find an online dealer that you like is by purchasing something from their site. I purchased flies from several websites until I finally found my go-to site to buy flies. My advice is to buy a little at a time to test the quality of the patterns. Afterwards you can then decide whether or not you want to continue doing business with them. Remember that you often get what you paid for. However I would rather have a cheap effective fly fall apart than an expensive one. Once you've figure out what to look for in fly quality, you'll know what to look for. Good advice and I like that website as well. Chico is fantastic! I'm trying to get in as much time as I can before I graduate this semester. Then its off to the real world which probably means less fishing.